Milan 2011: Designers Peter Bottazzi and Denish Bonapace presented this exhibition of recycled furniture used as planters, in Milan earlier this month.Milan 2011: Designers Peter Bottazzi and Denish Bonapace presented this exhibition of recycled furniture used as planters, in Milan earlier this month. Called Da Morto A Orto meaning 'from redundant to abundant' the furniture has been turned into hybrids by connecting them with other pieces. The pieces are intended to be for indoor kitchen gardens and for classroom horticultural lessons. 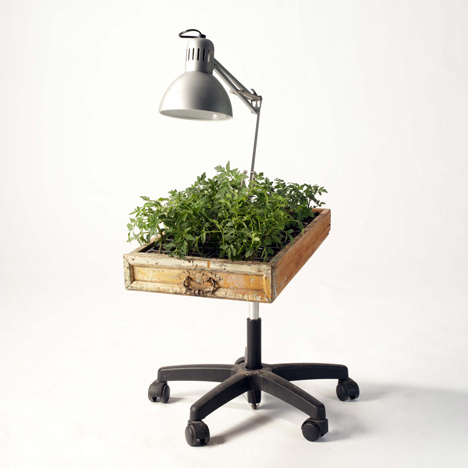 Grafts give life to abandoned furniture. For the Salone del Mobile di Milano 2011, Peter Bottazzi and Denise Bonapace will be featured on the Fuori Salone circuit with their project, entitled “da morto a orto” (“from redundant to abundant”). The project is promoted by AMSA, the municipal environmental sustainability agency, in partnership with the historic company Fratelli Ingegnoli, and with the not-for-profit organisation Banco Building. “Da morto a orto” isn’t just a collection of one-off pieces; it is a critical, ironic reinterpretation of everyday objects that we no longer recognise or that are on their last legs: objects and furniture around the house that are destined to disappear, to be “destroyed”, are here resuscitated with a new look. They’re reprocessed, patched up, hybridized and transformed before being grafted with plants, thus becoming “indoor kitchen gardens”, domestic classrooms for a “(horti)cultural education” offering lessons on how to cultivate the land and one’s feelings too. The project is intended to be the first step in a series of initiatives designed for Milan, in which culture and horticulture are blended together to create “cultivation seasons” during which people can develop and explore issues related to the education and conservation of the individual, the home, the city and the planet.